We are currently living in the age of the Comic Book Movie... and we couldn't be HAPPIER! There are all types of comic book adaptions finding their way to the big screen and TVs across the globe. Some are GREAT, some not so much. But all are doing it up in honor of the 50+ years of comic lore that exists in those funny books. While some actors have played the roles of certain heroes in numerous films, no one truly embodies their character more then Hugh Jackman playing Logan. In the 10 "X-Films" that Fox has produced over the last 17 years, Jackman has appeared as Wolverine in NINE of them (Deadpool is an X-Film and Wolverine does not appear in it). 17 years he has been playing James Howlett... or Weapon X... or just Logan. With the release of the newest film in the X-Series Logan on screens now, we take a look into the final performance of Jackman in the role and explain the burning question: Why does Wolverine MATTER in this day and age? 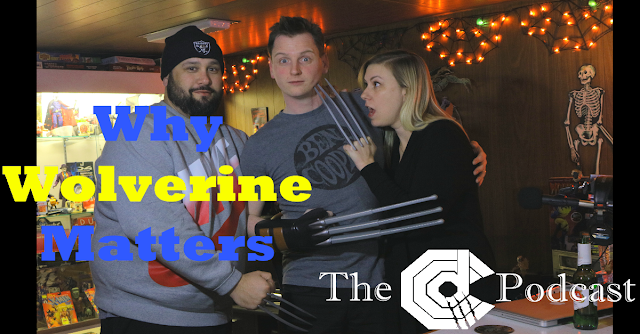 Jedi Rob is joined by Mike D and the lovely & talented Mrs Alicia Gomes in the CCD Nerdcave to chop it up about everything Wolvie.... what are you waiting for Bub? Give the ep a listen and RATE OUR podcast on iTUNES!